I stood on the shoreline at Laig, surveying my surroundings. The coastline was peppered with large boulders known as concretions; hard rocks eroded out of the softer cliff face over millions of years; a timescale incomprehensible in my world of sunrises and sunsets captured in perhaps a thirtieth of a second. Behind me, the scattered settlement of Cleadale was dominated by the near-vertical black crags of Beinn Bhuidhe. Across the water, the mountainous profile of the Rum Cuillin was shrouded in a blanket of cloud. Waves gently lapped at my feet and distant calls of cuckoos echoed from the cliffs high above. I inhaled the clean salt air and allowed myself a few moments of quiet reflection in the early morning light. I should have been jubilant at the prospect of returning home after seven nights in a shack infested with spiders and slugs, but I could have happily stayed another week. For many months I’d looked forward to this holiday on Eigg; suddenly it was over all too soon. 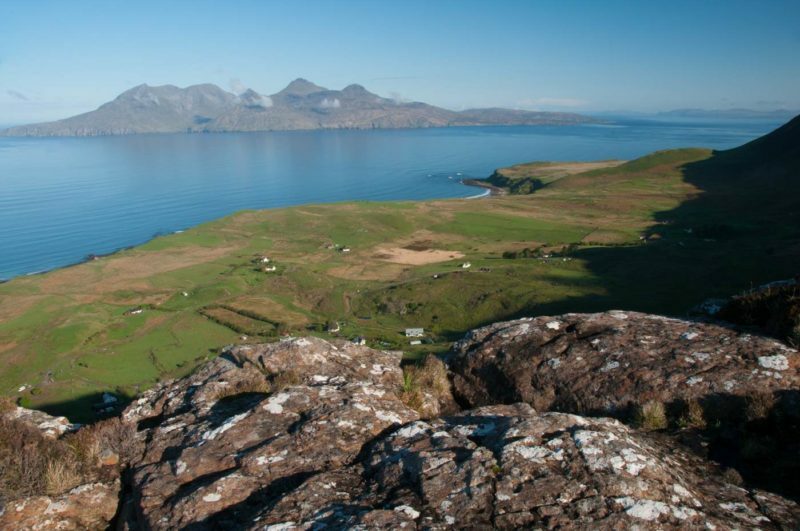 At 12 square miles (31 square kilometres) in area, Eigg is the second largest island in an archipelago in the Inner Hebrides known as the Small Isles, lying to the south of Skye and to the north of the Ardnamurchan peninsula. 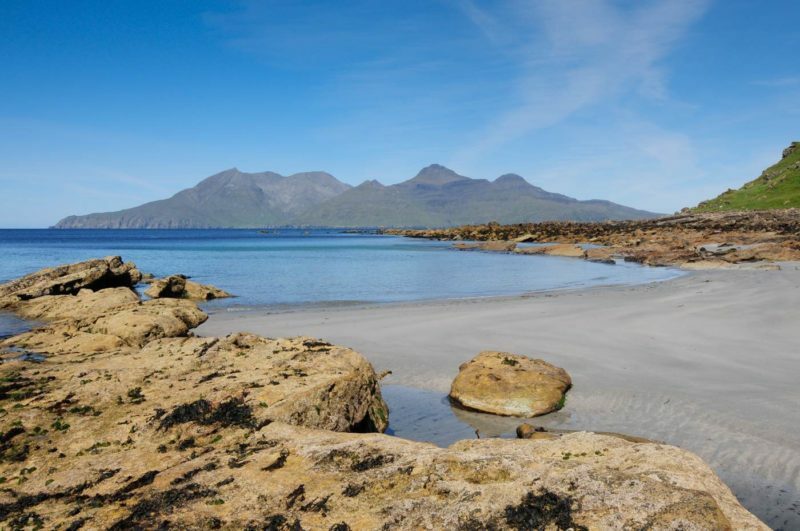 Its quirky name and those of its island neighbours – Rum, Muck and Canna – had captivated my imagination for many years, as had the distinctive profiles of Eigg’s highest point, An Sgùrr, and the mountains of Rum; enticing landscapes that I’d previously seen as silhouettes from Ardtoe and Camusdarach on the mainland. The beautiful and dramatic scenery of this island disguise its somewhat chequered past. In 1577, it was the scene of one of the bloodiest episodes in Scottish clan warfare. The Macleods of Eigg had taken refuge in a secluded cave to the south of Galmisdale on the eastern shore of the island. The MacDonalds of Skye, on discovering the hiding place, blocked the entrance and lit a fire, killing the 395 occupants of the Massacre Cave; almost the entire population of Eigg. In more recent times, Eigg has become well-known for its community buyout in 1997 following decades of controversial landownership ventures, and its subsequent embracing of renewable energy, which has brought an environmentally and economically sustainable electricity supply to homes on the island. 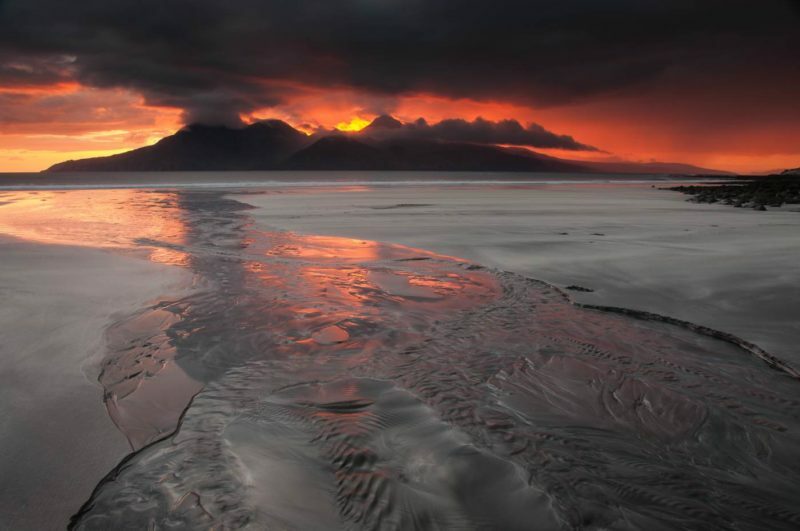 I first set foot on Eigg in 2009, shortly after purchasing my first DSLR camera. I landed on the north west side of the island at the Singing Sands, smiling at the squeaking sound rising from the quartzite grains as my walking boots scuffed across the surface of the beach. Accompanied by a group of fellow photographers, I spent the afternoon delighting in the stunning scenery and intriguing geology of the Bay of Laig. Until then, the closest I’d come to the island was a non-landing cruise of the Small Isles in 2002 aboard the Caledonian MacBrayne ferry, MV Lochnevis, which sails from the busy, functional fishing port of Mallaig at the end of the romantically-named ‘Road to the Isles’ west of Fort William. A brief encounter followed by a few hours ashore seven years later simply wasn’t enough to do justice to this island gem and it was inevitable that I would eventually return for a longer stay. The highlight of my week on Eigg presented itself in the form of a magnificent sunset behind the mountains of Rum. I left my husband relaxing with a glass of malt on the porch of our holiday accommodation, overlooking the settlement of Cleadale and the Bay of Laig beyond. The sky was cloudy, and the light was flat as I made my way down to the beach, fully expecting my camera to stay tucked in its bag for the rest of the evening. As I searched unsuccessfully for detailed compositions amongst scattered shells and seaweed, the colours in the sky gradually began to build, eventually reaching a crescendo of vivid red, orange and yellow hues, contrasting with the imposing mountains of Rum, cloaked in darkness. The light faded and the heavens opened as I made my way back to the shack in search of my own well-deserved wee dram. I may have been soaked to the skin, but nothing could have dampened my spirits when I reviewed the image on the back of the camera. Over the years I’ve become more and more selective about what I photograph. I’ve learned that setting up my tripod every few minutes and unzipping my camera bag to reveal a selection of filters and lenses is a sure-fire way to make myself unpopular with my walking companions. While I peer through the viewfinder, waiting patiently for the wind to drop or for a cloud to move into the frame, I become aware of the feet-shuffling and watch-checking beside me and know that I’ve pushed my luck far enough. My husband and I found a rhythm on Eigg that has suited us well in subsequent years. During the day, we walk or cycle together and I capture ‘snapshots’ on my compact camera. At dawn and dusk, I venture outdoors laden with photography kit while my husband dozes a little longer, prepares our breakfast, or relaxes with a single malt whisky and a good book. I may have missed out on easy conversation and shared memories but, by spending time alone in the outdoors, I have developed a deeper connection with the landscapes I photograph and the wildlife that inhabits them. I awoke before dawn the morning after the volcano-like sunset to find the storm clouds had rolled away to the east, leaving clear skies in their wake. With the Bay of Laig submerged by the tide, I made a spur-of-the-moment decision to venture up to the cliffs of Beinn Bhuidhe [Editor’s note: part of our Sgorr an Fharaidh route]. Beads of sweat tricked down my spine as I forced myself uphill on an empty stomach; my camera and tripod on my back. I reached the plateau, caught my breath and set up my equipment as the sun climbed into the sky and the shadows over Cleadale gradually receded. Cuckoos had provided the soundtrack to the holiday and I was thrilled when one of these elusive birds momentarily landed on the rocks at my feet before taking flight once again. With my expectations well and truly exceeded, I descended to Cleadale for breakfast with my husband, followed by a trek together across the island and an ascent of the magnificent An Sgùrr; its summit offering exquisite views of the Hebrides and the western seaboard of the Scottish mainland. I never failed to be amazed at what can be achieved in the space of 24 hours when we are released from the demands of daily life and are free to not only explore but truly engage with our surroundings in the absence of beeping mobile phones and the endless background noise racing through our minds. I stood on the shoreline at Laig, surveying my surroundings. I said a silent “goodbye” and turned my back on the beautiful bay. It was time to return to the holiday accommodation and begin the tedious task of packing. 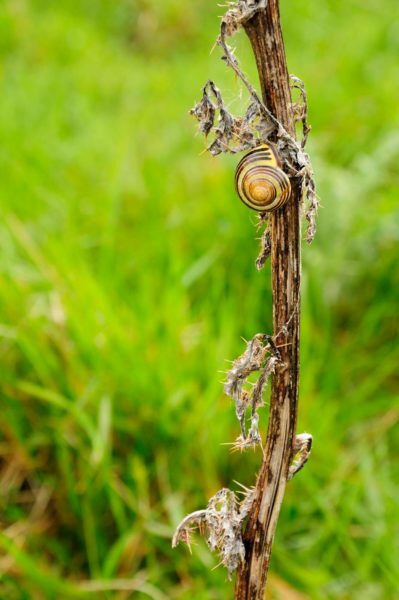 I followed a grassy track leading away from the beach and caught sight of a brown-lipped snail defying gravity on a blade of grass. My suitcase would have to wait a few minutes longer. I eased off my rucksack, sank to my knees and set up my camera and tripod a few inches off the ground. Lost in a world of my own, I carefully composed and focused my camera and lens until I’d captured an image to take home; another photograph invested with precious memories of excellent holiday. I gathered up my gear, hoisted my camera bag over my shoulder, said a silent “thank you” to the snail, then re-focused my wandering mind on the fact that there was a ferry to catch.